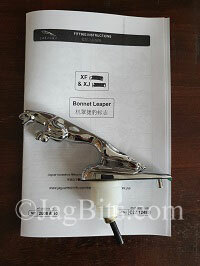 QUALITY Jaguar Hood Ornament OEM Jaguar emblem on SALE! The Jaguar hood ornament emblem also known as a hood leaper has been around since 1938, it was on top of the external radiator cap. It was used on the MK V saloon until 1951 when it went out of production. The next version was used in 1955 and for the next 14 years and was fitted on the MK1, MK2, MK VIII, MK IX, S-TYPE, 240, 340, and the XK 150. A third version of the Jaguar hood ornament was used on the MK X saloon in 1961. Since then, Jaguar owners have adorned their cars with the Jaguar hood ornament. Jaguar finally stopped installing the Jaguar hood ornament on new cars in 2005 but Jagbits has every Jaguar hood emblem available for sale on every Jaguar model from 1969 to the present models. We supply only factory OEM hood ornament emblems. They are made using the absolute best possible metals and are finished with the highest quality chrome plating. They are spring loaded which prevents any damage to your hood when someone steals the emblem from your car. When the top part of the leaper is pulled and twisted hard enough, the cable that attaches the two parts of ornament, snaps and the top part is detached leaving the base on the hood. This protects the hood from being damaged. To install the new part simply open your hood and locate the large white plastic nut under the hood that is securing the base to the hood. Remove that nut with an open end wrench, socket, Vise-grips or large set of pliers. Go to the base on the outside of the hood and remove it from the hood. This may take some extra effort since it is held on with double sided tape that has been there for many years. Do not pry the base off with anything metal as it will scratch the hood! You can use a plastic tool or fishing line or simply wiggle it around until it detaches from the hood. Now you will see two holes on the hood. One is the larger hole and a small locating hole behind it that stops the leaper from turning on your hood. Attach the part to your hood with the double sided tape. Go under the hood and attach the new plastic nut, tighten it and your new hood ornament is now the perfect emblem to adorn the front of your beautiful Jaguar sedan. If you have any questions or need any help buying or installing your new part please don’t hesitate to contact us we are here to help anytime. 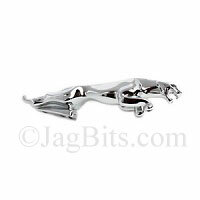 Find your Jaguar Emblem, then click the Buy Now button to order.